Siegmund Kadden with his grandson Aytan at the Jaffe Gate entrance to the Old City of Jerusalem. 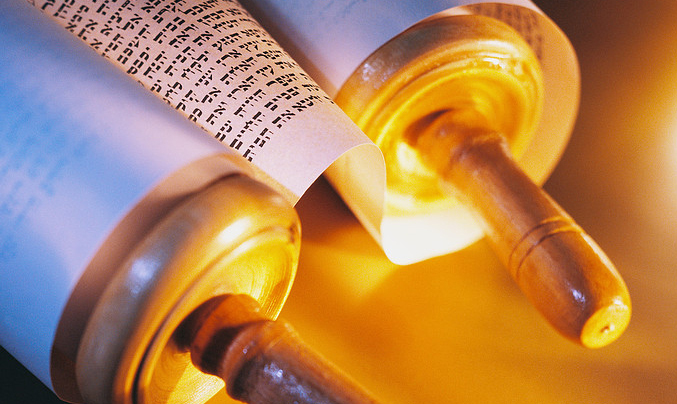 As he grasped both handles of the Torah and began to recite the brachot, I felt a lump in my throat. After 83 years, my father was called to the Torah in Israel, for the first time in his life. It was the first day of Chanukah, and – fighting off our jet lag – we had gotten up early to make it to Shacharit at the Chovevei Tzion shul, just a few blocks from our hotel. We arrived for the last minyan of the morning, populated mainly by retirees. My father, a kohen, was excited to duchan, something he had never done on a non-holiday weekday. As we came down off the bimah, the gabbai approached him and asked him his name. When the Torah was taken out, he was called up for the first aliyah. I’ll never forget that moment when proudly he began to recite the brachot that I’d heard him recite so many times before in his typical Yekke (Geman Jewish) fashion, almost mumbling them but strongly emphasizing the final word of each phrase. This chanting was so familiar and soothing to me; I recalled my father and many others making the Torah blessings that way in the German immigrant shul in which I grew up. This was my father doing something he loved, with great confidence. But as he recited the brachot, I heard faint laughter coming from the other side of the shul. I wasn’t sure exactly what it was, but I hoped my father hadn’t heard it too. When the third aliyah was called up and my father returned to his seat, I could see tears in his eyes. He said, “All my life I dreamed of going to Israel. Now I am here, and they laughed at me.” I felt heartbroken, but what could I say? He was right. I put an arm around his shoulders and hugged him, but couldn’t find any words to comfort him. My father had been a Zionist in Germany, belonging to a youth group that dreamed of aliyah, studying Hebrew and preparing for kibbutz life. He even brought his machberot (Hebrew notebooks) with him when he fled to America in 1935 — the year his mother began sending her offspring away as conditions for the Jews in Nazi Germany continued to deteriorate. Once in the States, my father met and married an American, and together they were able to rescue my grandparents and my aunt. They arrived in America in 1941, just before Jewish emigration from Germany was terminated. Once settled In Harford, my father was one of the organizers of a German minyan for the High Holidays, which quickly grew into the German shul, Tikvoh Chadoshoh, where he became president. When Israel was founded, he continued his dedication to Zionism: after a full day’s work as a mechanic, he would change into a suit and go out to sell Israel bonds. However, despite his dedication to the Jewish state, he was so busy raising a family, working two jobs to make ends meet, and serving as a leader of the shul, that he did not make it to Israel until 1990. That was the year his second grandson, my son Aytan, spent a year between high school and college studying at Yeshivat HaKotel in the Old City in Jerusalem. When I announced that I was going to visit Aytan for Chanukah, I asked my father to come with me. At first he hesitated, because of his age.Then he realized that this would be his last opportunity to see Israel. Finally, he agreed to come. When we arrived in Israel, he was excited by so much of what we saw. During our first afternoon, traffic near the Tayelet in Jerusalem came to a halt as we saw dozens of runners pass through the streets carrying a torch — Maccabiah athletes celebrating Chanukah. My father was ecstatic to see these “Jewish Olympians.” That evening, the first night of Chanukah, we danced with students in the street in front of Yeshivat HaKotel. My father loved the dancing, but was even more captivated by the number of people hanging out of the windows above us, clapping and singing along with us. This was so different from his experiences as a minority in Germany – and even in his beloved America. Throughout the rest of the trip, as we travelled around the countryside, he tried to see whether the tractor drivers were wearing kippot, and was delighted whenever he found one. There were many at Kevutzat Yavneh, a kibbutz where we spent a night with an old friend of my father from Germany, the daughter of the Lehrer (teacher) in Halsdorf. Although they found their one common language — German — so rusty they had a hard time using it, the childhood friends were nevertheless overjoyed to see each other after more than fifty years. Her son gave my father a framed photo that he had taken of the Kotel at night, a souvenir of his trip that he treasured for the rest of his life. He was also thrilled to see this thriving dati (religious) kibbutz and to eat in the common dining room; it brought back memories of his youth group in Germany and the life in Israel for which he had been preparing. So, as my father stood crestfallen in that shul on the second day of his dream-come-true, neither of us could bear his anguish of feeling like an unwelcome stranger in the place he’d always imagined would be home. We didn’t know what to say. With that, they were off and running, talking about their hometowns in Germany, their experiences during the Nazi years, their migrations, and their current lives. Quite a while later, before we parted, we agreed to meet them the next morning at the same Chovevei Tzion shul. When we met again after davening, one of them invited us to dinner at his home that evening. For my father, his encounters with other German Jews were among the highlights of his first and only trip to Israel, a place where, indeed, he truly was a landsman. Ron Kadden lives in West Hartford with his wife, Renana. The Kaddens are members of Agudas Achim Synagogue. Their sons – Yoni, Aytan and Jeremy – all contributed to this story. *A “landsman” is Yiddish for a compatriot — a Jew who comes from the same town, especially in Eastern Europe. KOLOT is a feature of the Jewish Ledger in which readers are invited to submit original work on a topic of their choosing. Inquiries and/or submissions should be sent to judiej@jewishledger.com.